The Vegan Cookie Connoisseur by Kelly Peloza Vegans Eat What? Kelly Peloza was inspired to write an entire cookbook dedicated to the making of vegan cookies. She began this quest as a high school student! She believes that recipes should be for anyone with a desire to create mouth-watering, delicious delicacies. Her first edition of this cookbook was published in 2010 and this newest edition includes eight new recipes in an additional chapter in the book. Her belief is that one should not have to go to a zillion health food stores looking for this and that; instead, she uses simple and natural ingredients found at any grocery store. Kelly’s book teaches everyone how to be a cookie connoisseur with basic information on topics ranging from ingredients to decorating. In addition to the two cookbooks, Kelly writes the food blog “ Seitan Beats your Meat”. The cookbook is beautifully designed and is filled with amazing photographs taken by the author herself. Her cookbook has over 120 recipes so there is sure to be something for everyone. The book begins with a section on ingredients, how to melt chocolate, and a Q&A section with questions such as “Why did my cookies turn out really hard?”. Next are the various chapters for different types of cookies such as “Cookies Inspired by Drinks”, “No Bakes”, “Fruity Cookies”, “Bar Cookies” and “New Recipes for the 2016 Edition”. This book is a gem filled with helpful hints, ideas for variations, and of course the classic recipes that can “wow” anyone. Particularly interesting is one of the new recipes for Meringue Cookies that uses aquafaba, the liquid in a can of chickpeas. There is even a treat recipe for our beloved doggies, Peanut Butter Dog Treats. I would have preferred that the print for the ingredients in the recipes was a bit larger for easier reading. The recipes are easy to follow; however, when making the Pina Colada Cookie Bars, I almost missed the final ingredient for the topping as it was in the next column where the next stage of the recipe began. About the recipes . . . I tried Adorable Bleeding Heart Sandwich Cookies, Mocha Cappuccino Cookies, Piña Colada Cookie Bars, and Mexican Wedding Cookies. 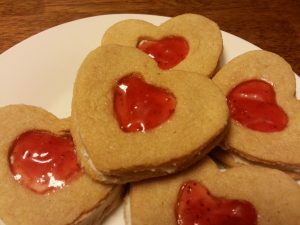 I share the Adorable Bleeding Heart Sandwich Cookies below. I used heart shaped cookie cutters as a variation. Recipe from book . . . I think you will enjoy these Adorable Bleeding Heart Sandwich Cookies pages 256-257, from The Vegan Cookie Connoisseu cookbook. Cream the margarine and sugars together with an electric mixer. Add 3 tablespoons of the soy milk and the maple syrup. Gradually sift in the flour, stirring often. Add the last tablespoon of soy milk if necessary. The dough should be kneadable, not sticky or dry. Wrap in plastic and chill in the refrigerator for 20 minutes. In the meantime, make the icing. Using the mixer, cream together the margarine and shortening, then add the powdered sugar and vanilla. Set aside. Divide the dough in two. On a floured surface, roll out each portion of the dough ¼-inch thick. If the dough is too stiff or cracks when rolled, it is too cold. Let it sit out for a few minutes, then knead it a bit and proceed. Cut out cookies with a fluted 2-inch circle cookie cutter and set on a greased or parchment paper-lined cookie sheet. Using a mini heart (or star, or whatever tiny shape you like) cookie cutter, cut out the centers of half the cookies and collect the dough. Roll it out and cut more cookies, repeating the process until dough is gone. Half your cookies should be normal and the other half should have a heart in the center. Bake cookies for about 10-12 minutes, keeping an eye on the heart cookies to make sure they don’t burn. Remove from the oven when the edges are golden. Let cool completely on a wire rack. Spread 1-2 teaspoons of icing on top of each plain cookie, top with a blob of jam, then place a heart cookie on top. Repeat for all cookies. Store in the fridge, then let sit out for about 10 minutes for serving.